Raw rhubarb is a delightful seasonal sour flavor, great for hot days and meals outdoors. It’s also an excellent source of calcium, vitamin K, and prebiotics to feed the good bugs in your gut. 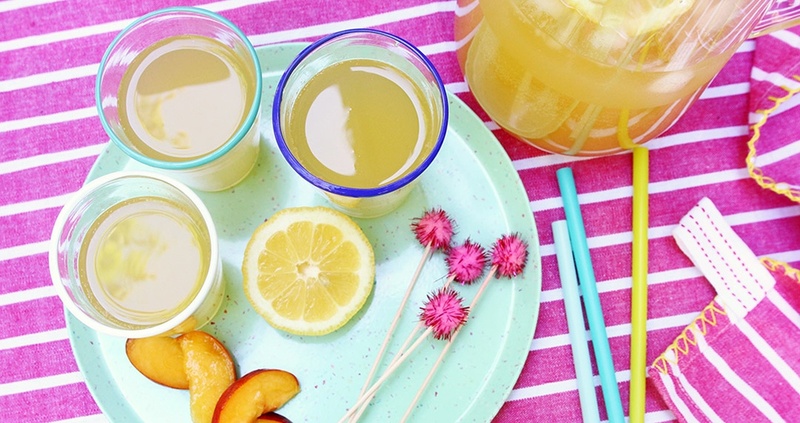 This punch is a pleasantly floral alternative to a traditional lemonade, and it’s just as delicious for kids as it is for adults. *Will require a juicer. Feel free to substitute no-sugar-added cranberry juice for a tasty, tart alternative. Clean, peel and chop rhubarb, then process it through a juicer to create about 8 ounces of rhubarb juice. Add the rhubarb juice and chopped peaches to a blender and blend for about 1 minute. Strain out the peach fiber with a fine mesh strainer and discard it. Mix in the 4 teaspoons of Calm Specifics Kids. Add ginger ale to your rhubarb and peach mixture and stir gently. Serve over ice, alone or with a thin slice of lemon or a sprig of mint.